The main objective of the present study is to project the future scenario of land use/ land cover on the basis of their past pattern of change. Indus basin with its diverse physiography is an ideal study area. Remote sensing sources from Landsat (MSS), LISS-I and LISS-III (1985–2005), were used to assess the past land use at a scale of 1:250,000. A statistical driver-based model was used to simulate the land use scenarios for 2015 and 2025. The model output was validated by comparing the simulated maps with reference ones for 2005 and 2015. All the land use classes displayed an overall accuracy of 85–90% with the exception of the classes “built-up” and “wasteland”. Indus valley has unique physiography and strategic significance for water resources and climate change impacts. There was a gradual but significant rise in the built up area, a major reduction in the acreage of cultivated land with time. 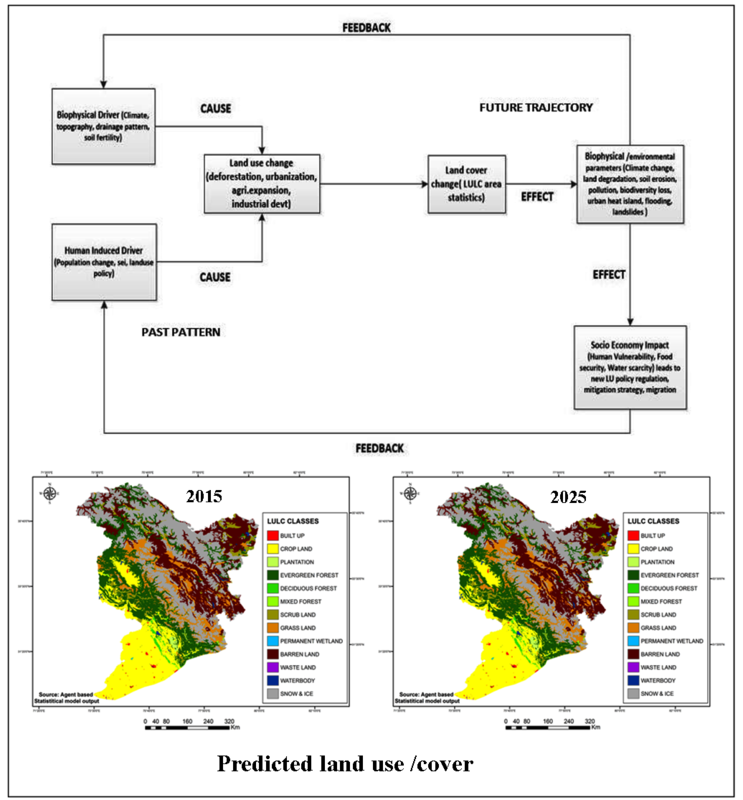 The study evaluates a dynamic land use simulation model developed to predict future land use scenarios of the basin on the basis of its past processes of change. Physiographic and socio-economic drivers were used to predict the future land use land cover. LULC classes over the basin area were modelled using a combination of transition probability and regression equation based on their past pattern of change with an average accuracy of 80 to 85%.